Budget Mailboxes offers standard system Aluminum Mailboxes at factory direct prices. 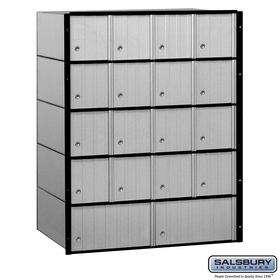 These 2200 Series mailboxes come in six unique door configurations. Question: Is there a plexiglass window for aluminum mailboxes? Answer: Yes, please click the link to view the Plexiglass Window for aluminum mailboxes. Thank you. Question: I'm looking for standard 30-door, front loading, aluminum mailboxes. Answer: Please click the link to view the 30-door front loading aluminum horizontal mailbox. Question: Do you have 30-door models with combination locks rather than keyed locks? Answer: Combination Locks can be added to this box as an option. Question: I am looking for an aluminum, rear-loading A door box with 7 boxes across and 7 boxes down, a total of 49. Answer: The only product we carry close to that description is the 35-Door 4B+ Horizontal Mailbox Rear Loading A Doors USPS Access. Please call us at (866) 707-0008 for further assistance. Thank you. Question: I am looking for horizontal, aluminum, front-loading mailbox, 6 boxes high and 5 boxes across. Answer: Please view our 30-Door (29 Usable) Front Loading category page for more details. Feel free to call us at (866) 707-0008 for further assistance. Thanks. Question: How do you mount to a wall if needed? Are there brackets or something to use? Answer: There is no standard wall-mount option as these units are rear loaded. Please see the installation instructions link on the item page. 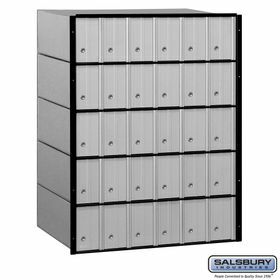 Question: Do you have any used 30-door, 18-door, 6-door brass or aluminum available for mailbox rental store front consideration? I need a deal overall to make it work. Answer: We do not sell any used product at this time.